Amiens is perhaps most famous for its cathedral. The cathedral was constructed between 1220 and 1247, after a fire destroyed a previous cathedral on the site. The building is constructed in three tiers in the Gothic style, and is the largest in France of its kind. Particularly noteworthy features including the beautiful sculptures and the inlays in the floor. Amiens is a city on the Somme River, about 75 miles (120 kilometers) North of Paris, in northern France. Amiens is the capital of the Somme department in the region of Picardy. 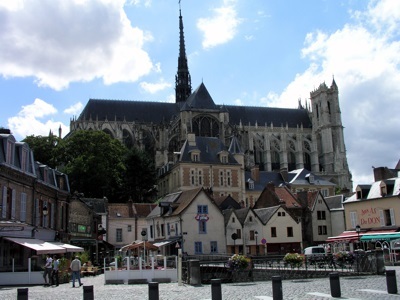 Amiens is perhaps most famous for its Gothic cathedral. The cathedral was constructed during the 13th century, is the tallest large classic Gothic church of the 13th century, the largest church of its kind in France, and a UNESCO World Heritage Site. Another well-known aspect of Amiens is the many gardens ("hortillonnages") built on the small islands on the marshland between the River Avre and the River Somme. The islands are surrounded by a network of canals ("rieux"), and a result the gardens are sometimes called the "Little Venice of the North". Amiens was heavily fought over during both World War I and World War II, and as a result the town suffered much damage. As a result, much of the city was rebuilt after the Second World War. The author, Jules Verne, lived in Amiens from 1871 until his death in 1905. Among the many works that he wrote while living in Amiens are Le Tour du monde en quatre-vingts jours (Around the World in Eighty Days), L'Île mystérieuse (The Mysterious Island), and Hector Servadac (Off on a Comet). Jules Verne's grave (marked with a listed statue) can be found in the town in the Cimetière de la Madeleine (the Madeleine Cemetery). Each December, Amiens is home to the largest Christmas market in northern France. Amiens is also known for containing one of the few remaining permanent circuses, the Municipal Circus (also known as the "Cirque Jules Verne"). The author, Jules Verne in fact presided over its openining in 1889.